More and more people pay with plastic these days than they do with cash, and as credit card usage increases, so does credit card fraud. According to a report from Barclay’s, most credit card fraud occurs in the United States, accounting for 47 percent of the world’s card fraud. In 2014, approximately 31.8 million US cardholders had their cards breached, nearly triple the amount of 2013. As a result of the increasing number of card breaches, credit card companies and merchants are on high alert for credit card theft—especially as credit card fraud is also committed in conjunction with identity theft. If you have recently been arrested and charged with credit card fraud in Miami, you face a federal criminal violation and severe consequences. To learn more about your defense to the charges brought against you, contact the Miami white collar crime lawyers at The Baez Law Firm right away. According to Title 18 U.S.C. §1029, it is a criminal offense to knowingly and with intent defraud to use, produce, or traffic in counterfeit access devices—access devices being cards, codes, plates, account numbers, electronic serial numbers, mobile identification numbers, personal identification numbers, or other type of account access that is used to obtain money, goods, or something of value. The same statute also applies to debit cards, ATM cards, gas cards, and other means of “plastic payment.” A merchant account number that is used to perform credit card purchases qualifies as an access device as well. The use negatively affected interstate commerce. As we mentioned earlier, credit card fraud is an extremely serious offense, and first time offenders are subject to up to 10 years in prison. Subsequent offenders are subject to no more than 20 years in prison. If you have been charged with credit card fraud in Miami, your best defense is to contact a Miami white collar crime lawyer right away. We can help you come up with a viable to defense to the charges brought against you. 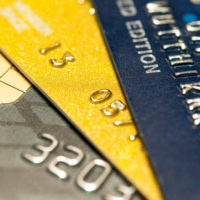 Once defense to credit card fraud involves mistaken identify. Because it is not always clear who committed the crime, we may be able to convince the judge and jury that the prosecutor has the wrong guy—especially if there is a lack of evidence to prove otherwise. Another defense we can utilize is to claim that you had authorization to use the card. If you can prove that the cardholder gave you permission to use his or her card, the charges against you will be dropped, as it is not a crime to use someone else’s card with their permission. At The Baez Law Firm, we advocate for the accused and fight aggressively to get the charges against the dropped, or at the very least reduced. If you or a loved one has recently been charged with credit card fraud in Miami, Orlando, or the surrounding areas, contact The Baez Law Firm at 800-588-BAEZ to meet with an experienced criminal defense lawyer right away.